Home >Debates >Is black a color? I will argue in favor of the resolution that black is indeed not a color. However, for pigments, black is indeed a color. And in that case, white is not. 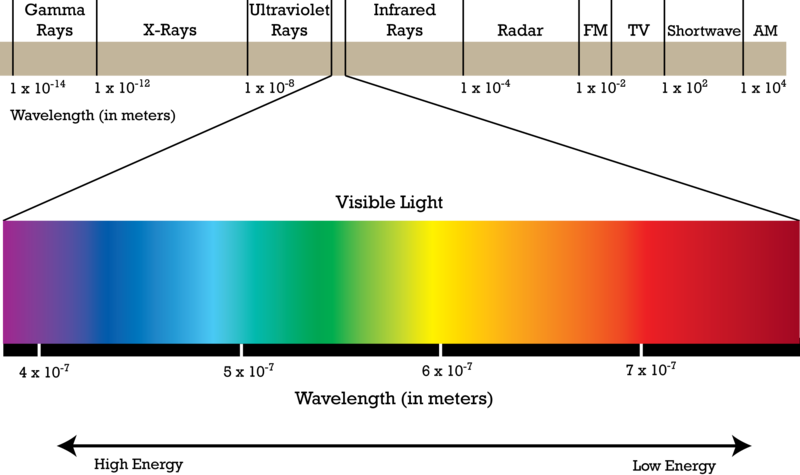 The electromagnetic spectrum (Above) is the range of wavelengths and frequencies over electromagnetic radiation. Wavelengths are distances between two crests. And depending on that, there is a color for the electromagnetic radiation. It is measured in nanometers. For instance, an electromagnetic radiation that has a wavelength between 492 nanometers to 577 nanometers is green. A plant's clorophyll molecules reflect that, while absorbing other ones. However, black objects don't reflect any. It simply absorbs them. How? Because the electromagnetic spectrum does not consist of black. I have come to the conclusion that black is merely the absence of the presences of the electromagnetic spectrum colors. What is the colour of Batman's Cowl? "What is the colour of Batman's Cowl?" None. All electromagnetic spectrum colors' presences are absent. Like said, depending on an electromagnetic radiation's wavelength, it becomes colored. However, it can not become black. Therefore, a black object's molecules simply absorb, rather than reflecting one. okay I know i'm not supposed to post arguments on comments. BUT, black is technically a color. It is an achromatic color, which means that it cannot be measured in terms of, ironically 'color', and saturation, but it is a 'color' that has only brightness. No, black is not the absence of color. Black is all colors combined together. White is the absence of color. You probably just copy pasted that. You do the same debate every time and use the exact same argument to start off with. I bet you couldn't win a debate besides this one. Reasons for voting decision: What is the point of voting? Black is obviously not a color. Points to Con for Pro's concession.